This section contains information related to My Travel Lite, flight code VZ, a low-cost carrier charter type. 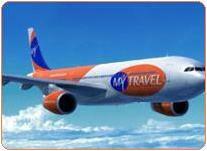 "MyTravel is one of the UK's leading holiday and leisure groups. The MyTravel Group of companies includes big holiday names such as Airtours, Aspro, Escapades, Panorama and Manos and these well-established tour operators can be booked online at mytravel.com." Click to browse to the network development section of this site, featuring more more information on the network development of My Travel Lite.